Rub lamb with olive oil and a little ground cinnamon, cumin and coriander seed. Massage well and allow meat to come up to room temperature before cooking in a hot pan for about 4 minutes each side, depending on thickness and preferred level of doneness. Allow to rest for 4 minutes before carving into slices. Place cauliflower florets into food processor and blitz on high until cauliflower resembles cous cous. Alternatively, you can grate cauliflower finely. Put a large frypan or saucepan over medium heat, and add liquid coconut oil. When hot, add cauliflower and peas and cook stirring occasionally for about 5–7 minutes. Cauliflower should be just cooked through. 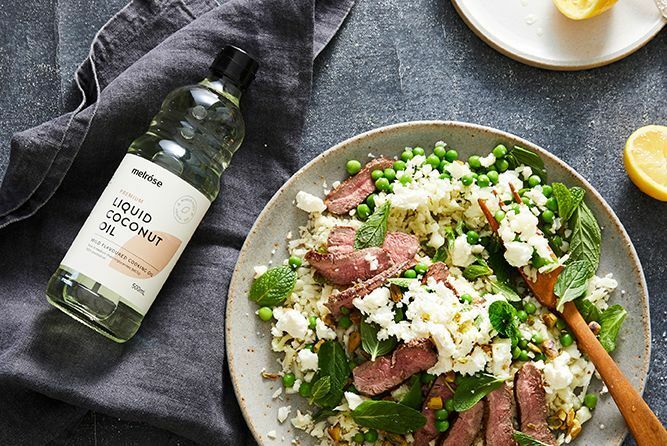 Add mint, feta and pistachios, combine. Season with salt and pepper. Serve with slices of lamb and garnish with extra herbs and pomegranate seeds. Season with salt and serve warm or cold. 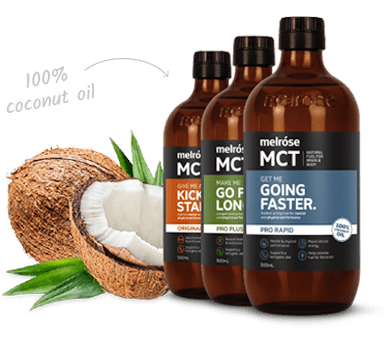 Melrose MCT is made with only the best part of the coconut and helps support mental and physical performance. Discover the Melrose MCT Range.